Come and Join us for worship this Sunday! Our worship is a time for us to gather with fellow believers around God's Word. Through God's Word, we are strengthened and refuled to go back out into the world and live for our Savior, Jesus Christ. We worship Sunday mornings at 8:00am at St. Jacobi Lutheran Church and 9:30am at Zion Lutheran Church . Our worship is centered around Christ and the Word of God that reveals him. We worship our Savior through the singing of psalms, hymns, and spiritual songs. Our worship includes prayer, praise and proclaimation of God and His Word. If your a little nervious about visitining us in person, check our our Worship Services Streamed Live Sunday Mornings at 9:30 am at Zion from our youtube page. If you missed a Sunday or just want to get a taste of what you will hear when you join us, We got you covered. 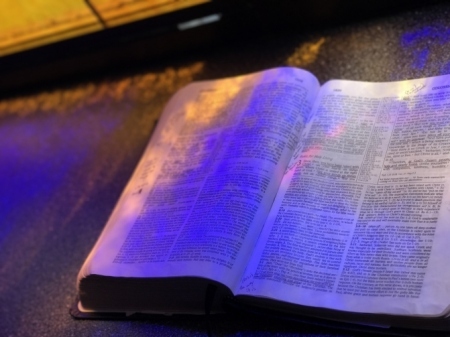 Check out our Sermon database for messages that are centered on the the Word of God and applicable for life. If you like what you hear don't be afarid to suscribe to our youtube channel so you can be notified when the most recent sermon or service has been uploaded. Zion Lutheran Preschool exists To assist and support parents in the academic, social, and spiritual growth of their children by using God’s Word to teach them God’s plan of salvation and to show them their worth as His dearly loved children so that they may be prepare for life now and in heaven. The purpose of Zion Lutheran Preschool is to share the good news of God’s love with his little lambs. Our main goal is to provide a variety of early learning experiences that help parents in nurturing the spiritual, intellectual, physical, emotional, and social-emotional development of their preschoolers. We believe this goal can be reached when children are actively learning and engaged by hands-on learning experiences that are developmentally appropriate for young children. We also believe children develop best when all experiences occur in an environment of Christian love, care, trust, and respect. Our day includes: Bible stories, language development, math, music, literature, art, science, and large and fine motor skill activities. We also have Work (Play) Time, Story Time, and Outside Time. Students must be 3, 4, or 5 by September 1st, 2019 and potty trained before attending preschool. We are now enrolling for St. Jacobi and Zion church members and current preschool families! Enrollment for the public begins Wednesday, February 13th at 7:30am! 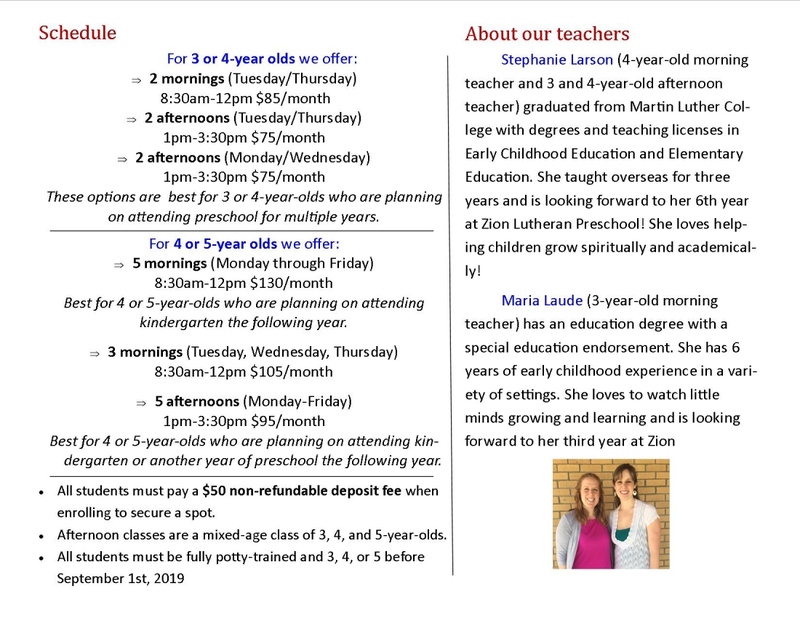 If you want to know more about our preschool check out their webpage. Join us Sunday mornings right after worship for Bible Studies focused on various topics. Sunday Bible class is held immediatley following worship at Zion. We currently have sunday school and Bible class directly follwoing Worship at 10:30 am. Throughout the week join us for Bible Studies that Focuses on the different apsects of sharing your faith. This year we will focus on witnessing to people in our lives. (Topics include: The reason we witness, what we use to witness, who to witness to, other religions and how they differ from Christianity, and how worship can play a part in witnessing.) These classes will be offered Wednesday Morning at 10:00 AM at Zion. Come and be strengthened by God's Word. The Great Commission of Matthew 28 tells us that we must be going into all the world, making disciples of persons in all nations. At Zion, we aim to take that seriously by using whatever means we have to promote worldwide missions. Zion is a member of the Wisconsin Evangelical Lutheran Synod (WELS). A good portion of the offerings that we take go to support the work of our synod wich includes sending and supporting Missionaries all over the world. If you would like to know more about the Work of our Synod click here.